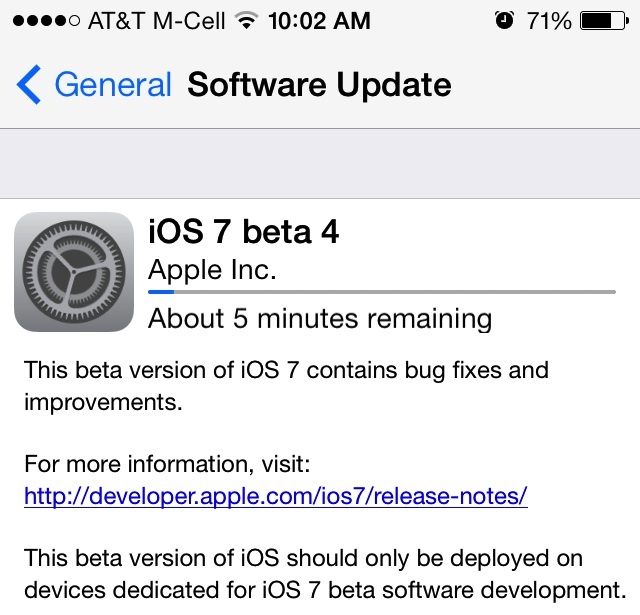 In line with hints and rumors from earlier today, Apple has just pushed out a fourth beta version of iOS 7 to developers for testing purposes. The update is arriving as both an over-the-air update to existing beta testers and through the iOS Dev Center. As expected, the new beta arrives as build 11A4435d. Apple has also released Xcode 5 Developer Preview 4 and a third beta of the Apple TV software under development. The three-week interval between the third and fourth betas is longer than the two-week intervals seen for earlier for betas of iOS 7, although Apple typically stretches out seeding intervals somewhat as it proceeds through development. Apple's Developer Center was also taken offline for eight days following a security breach, an issue that may also have contributed to Apple extending the interval between beta releases. iOS 7 is scheduled for release in the fall of this year, with updates to Apple's iPhone and iPad lineups expected around the same time. If past history is any indication, iOS 7 should be made available to the public just a few days before the launch of the next-generation iPhone. Really, we don't need to know! Would someone post Release notes please? They should rename "Preparing to Update" to "Teasing..."